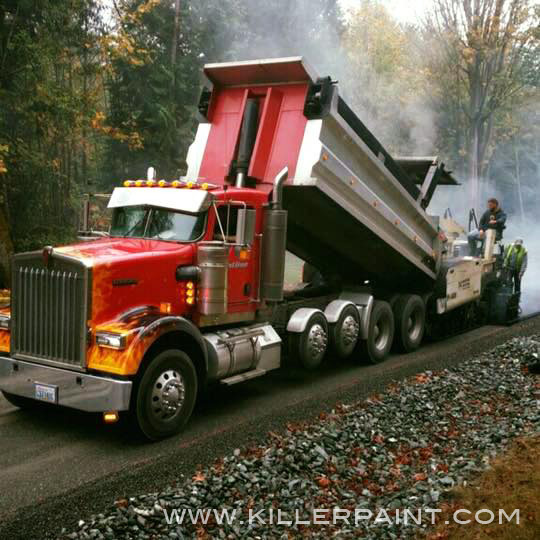 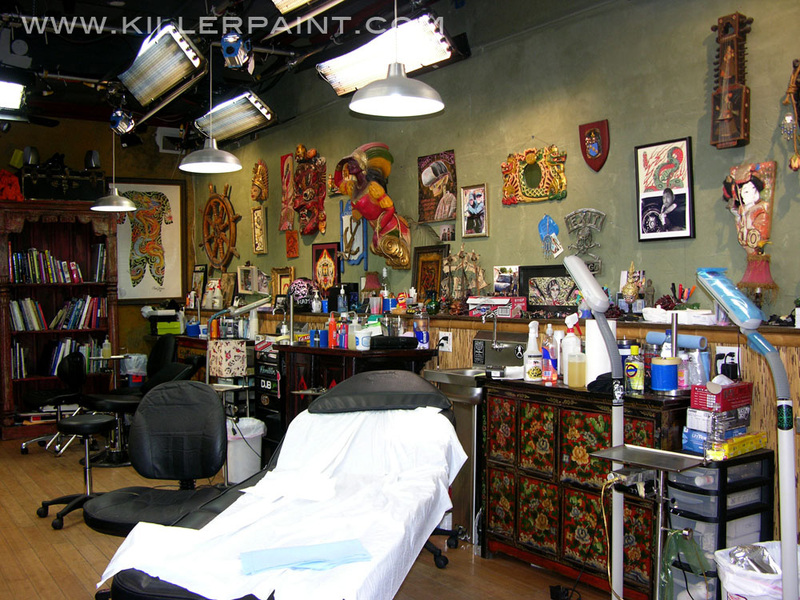 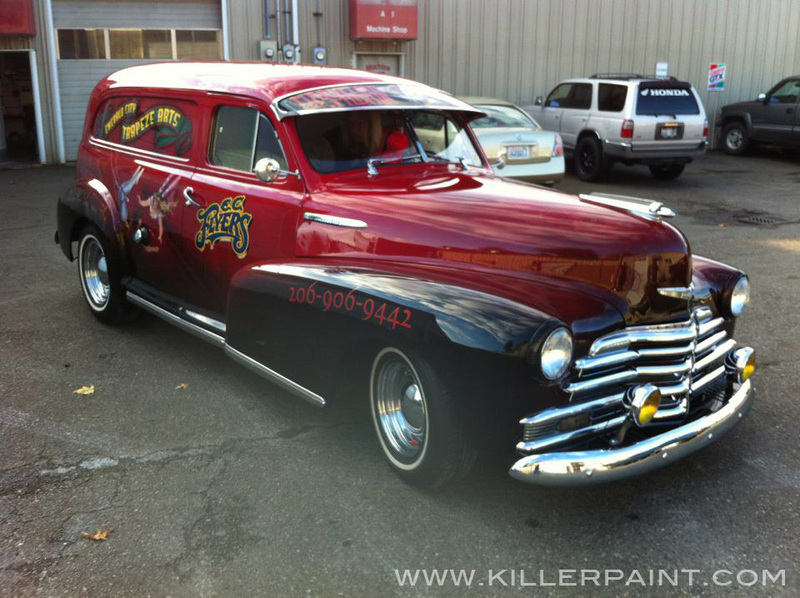 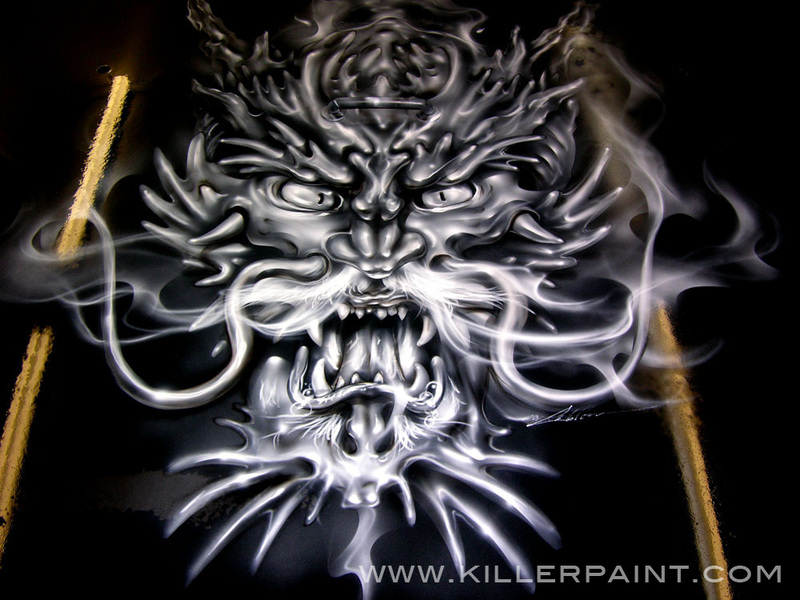 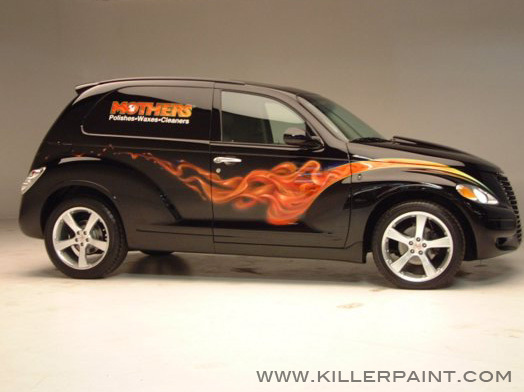 This project rolled out of the Killer Paint shop back in 2006. 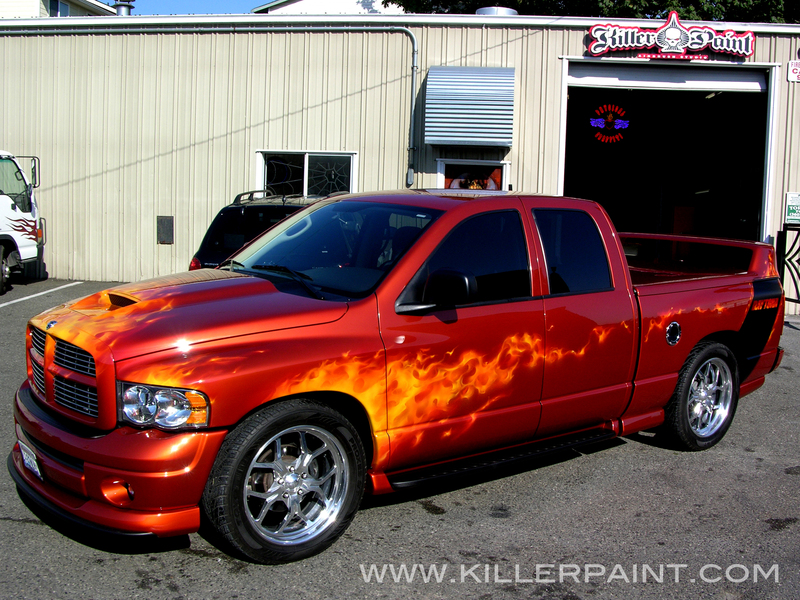 Back then, the owner of this Limited Edition 2005 Dodge Daytona extended cab truck brought it to the shop to get the Mike Lavallee treatment. 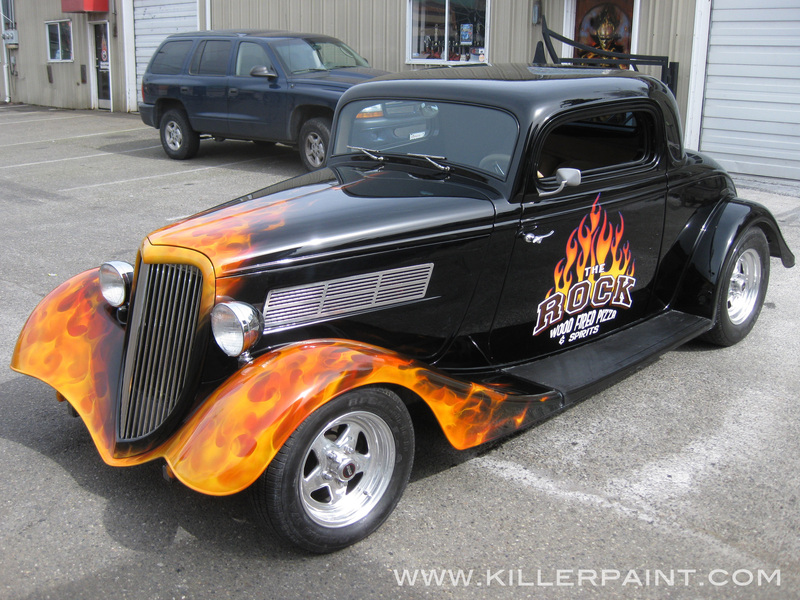 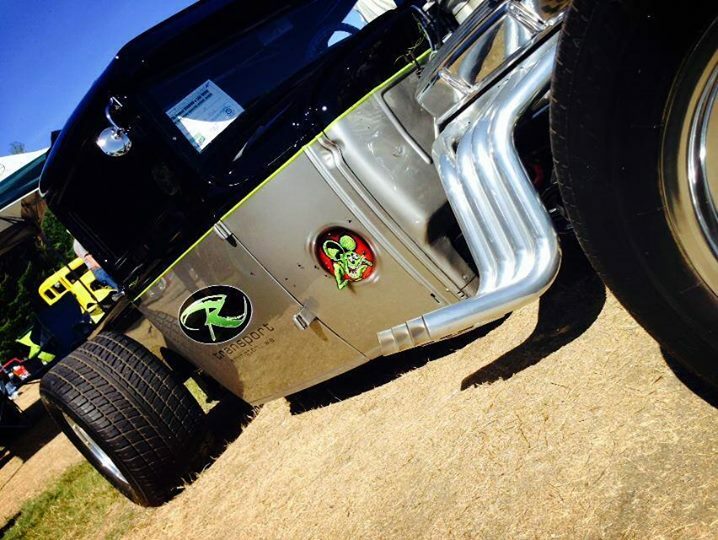 This race-inspired performance pickup was begging to be given a head-turning look. 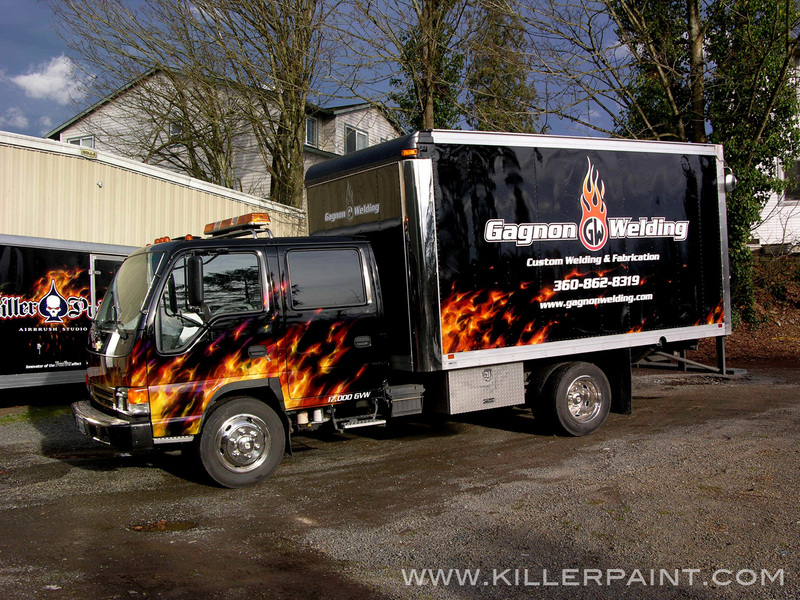 The truck’s base color was to stay the lovely Dodge “Go Mango” color it came in. 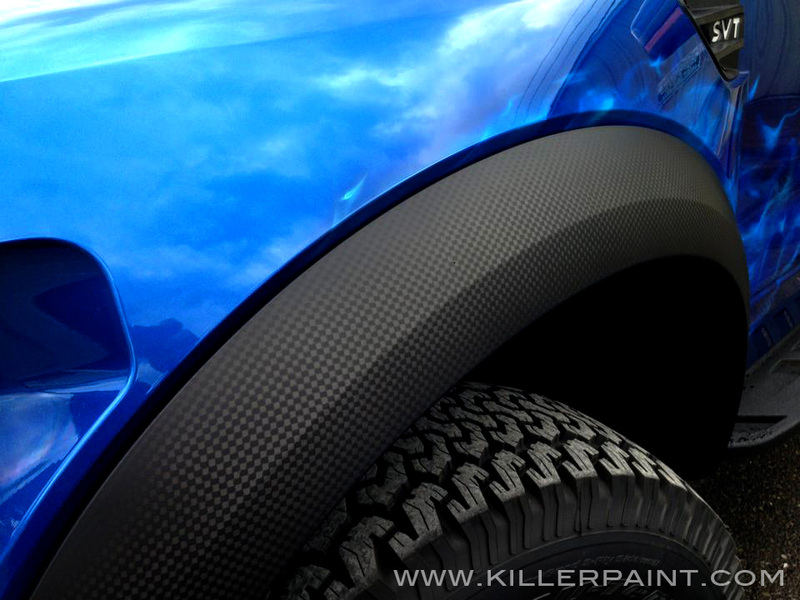 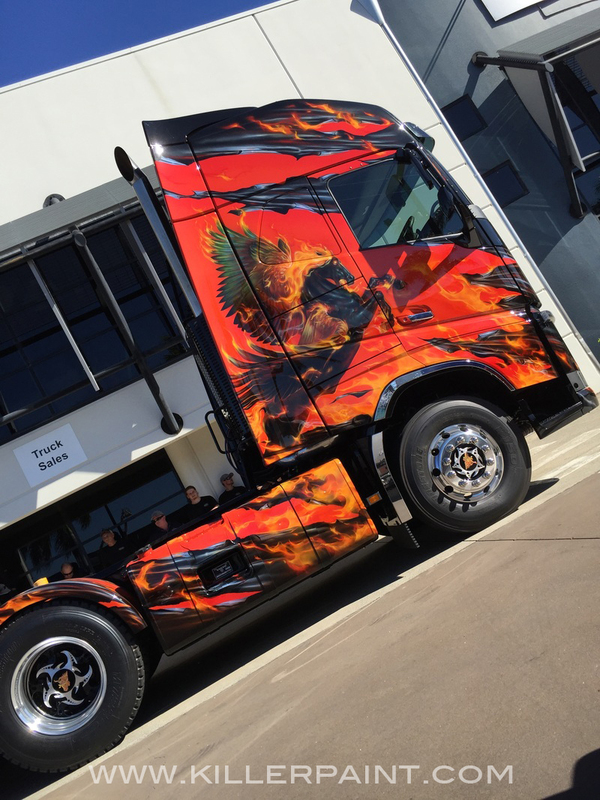 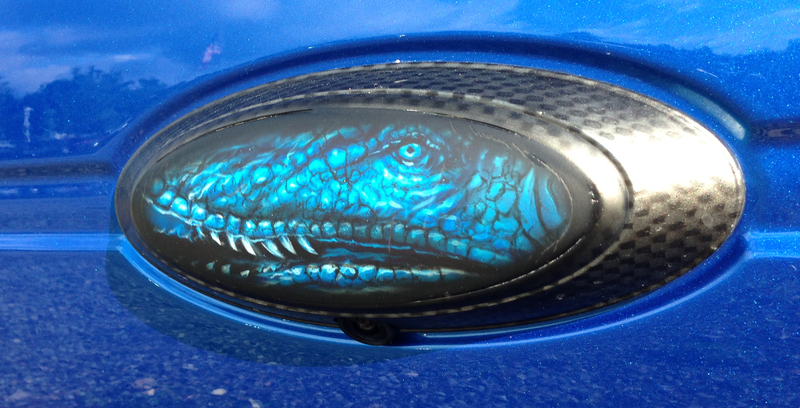 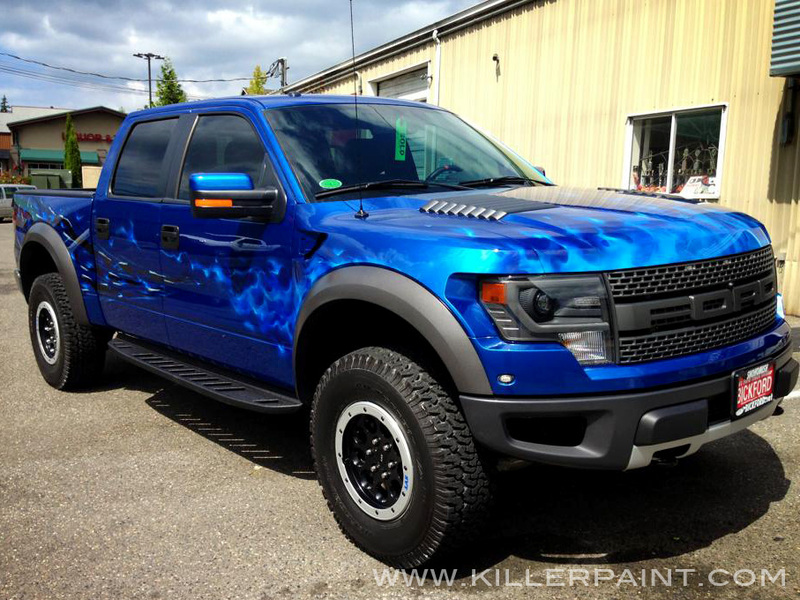 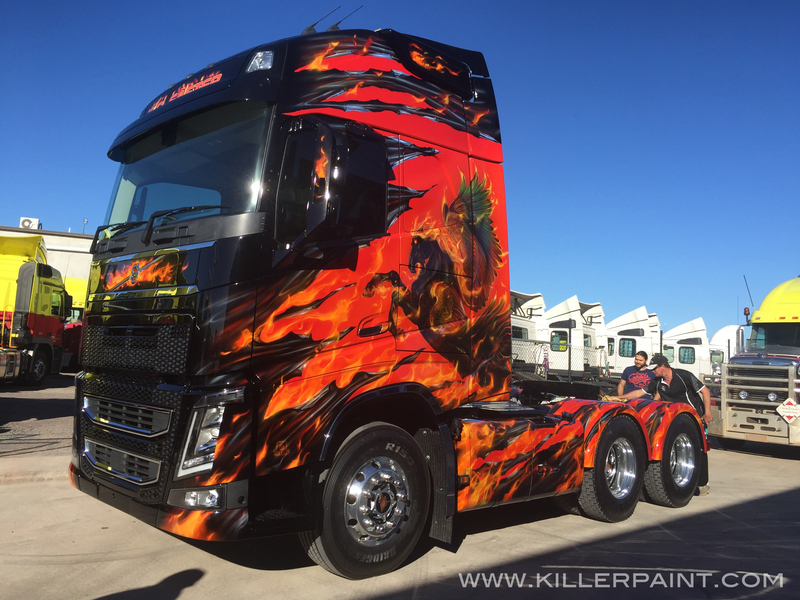 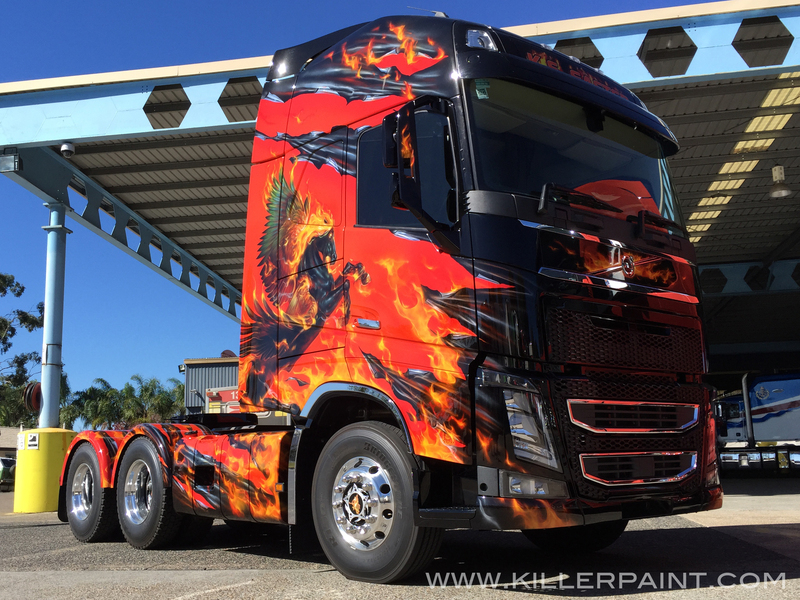 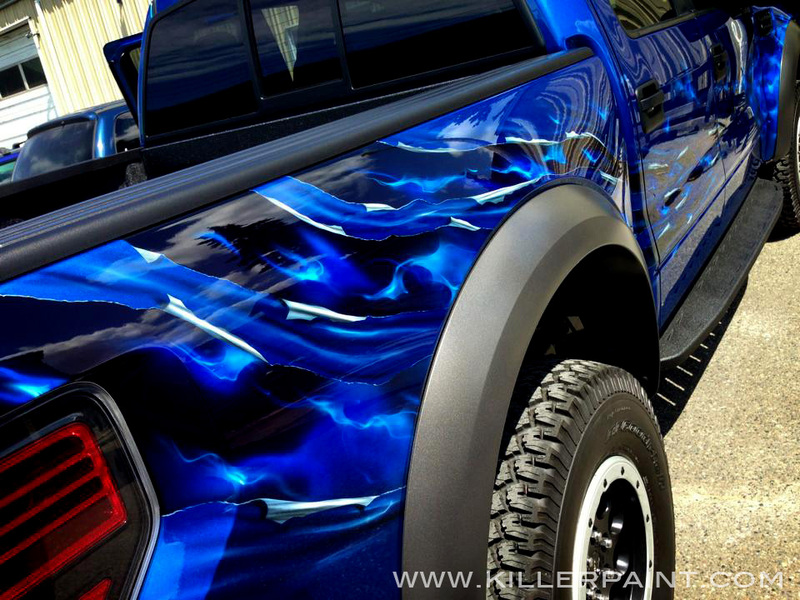 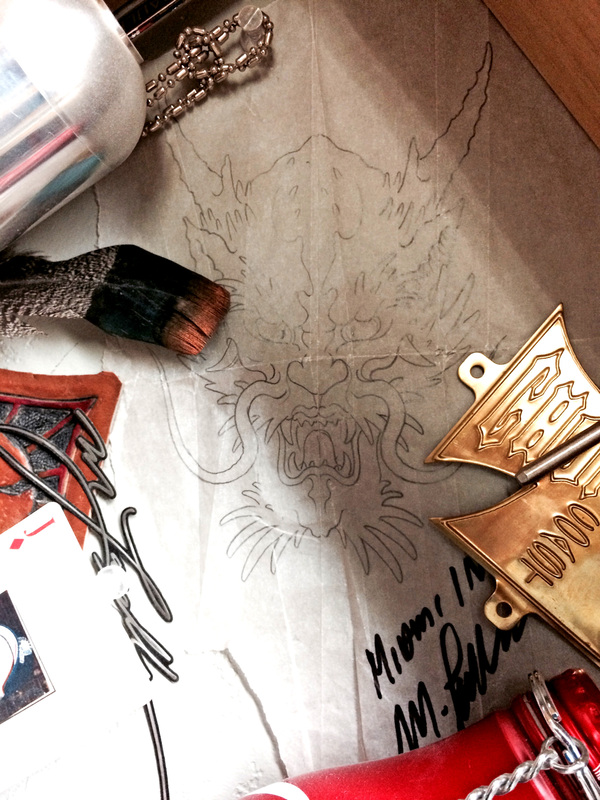 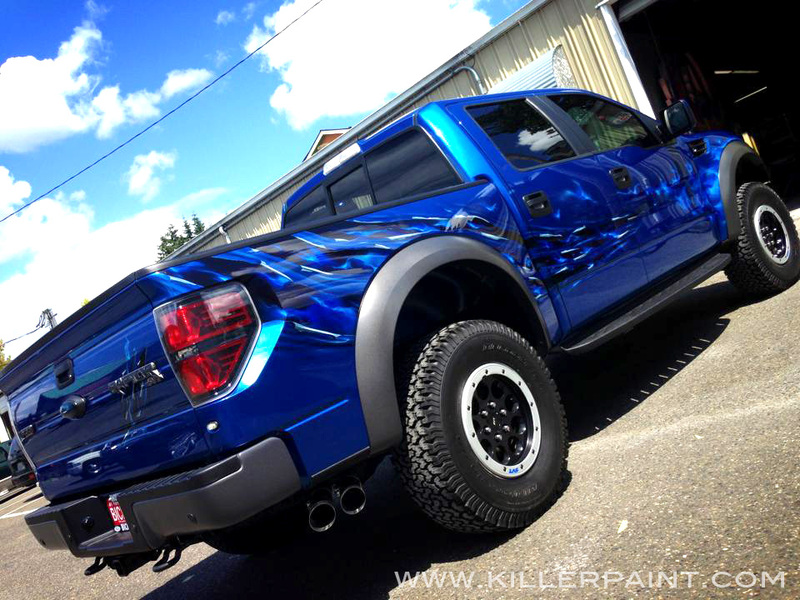 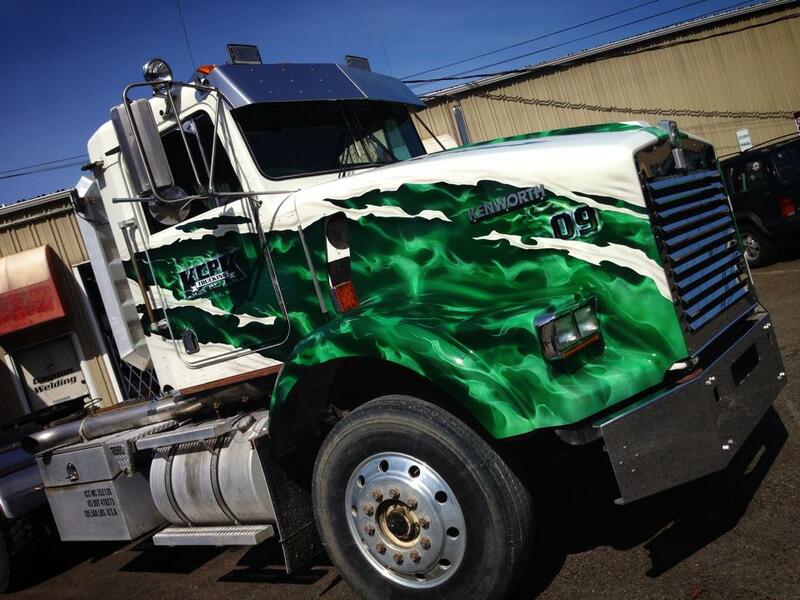 This color already looks hot, but with Mike’s airbrush it got hotter, with some True Fire™. 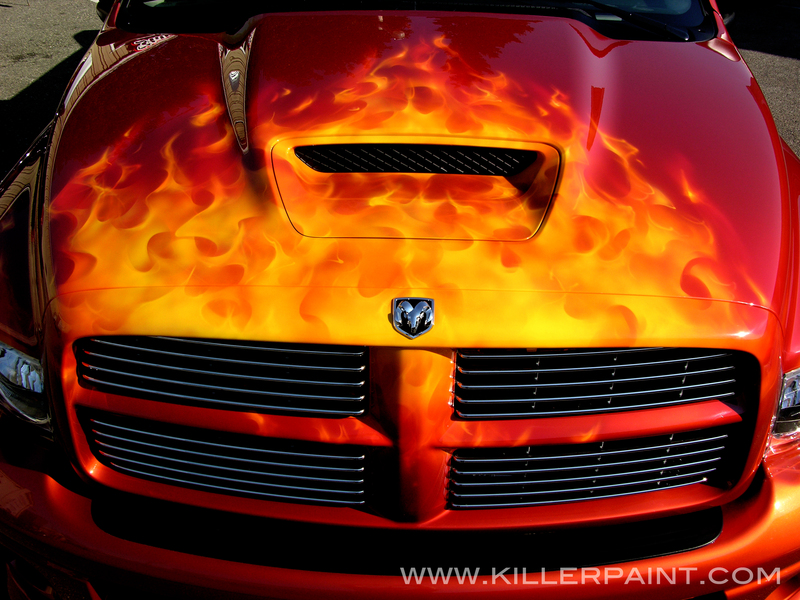 The hood and grill lead the charge with a sheet of fire coming off the front, as well as some smaller flames off the headlights. 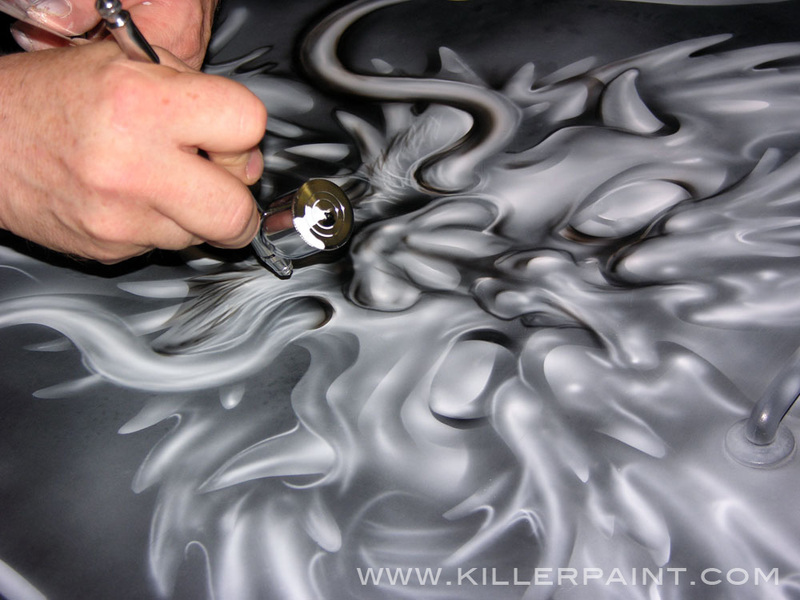 Keeping the stock color was a great choice, as the rich reddish-orange pearls of the background can work exceptionally well with fire, and Mike knows how to pick the best “temperature” of flames to really work with this color. 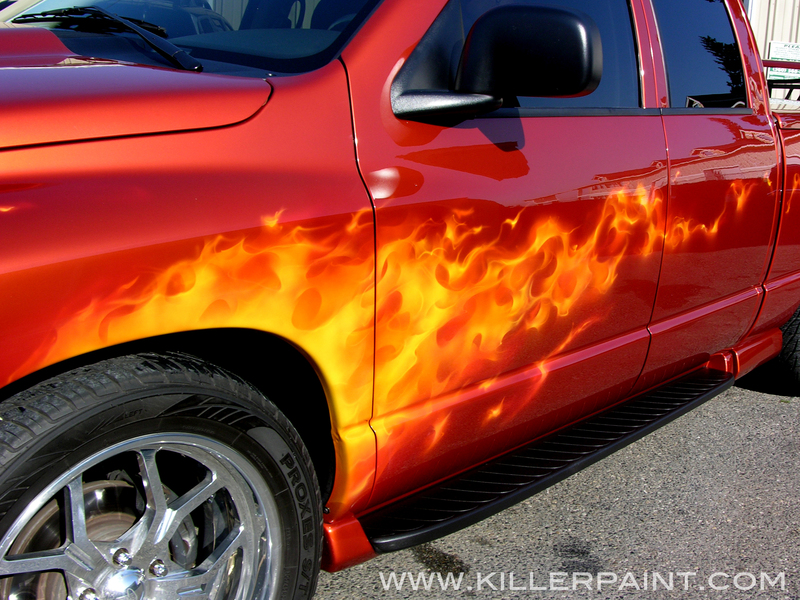 Its luminescence adds a boost to the glow of the flames, really making the whole thing light up in the sun. 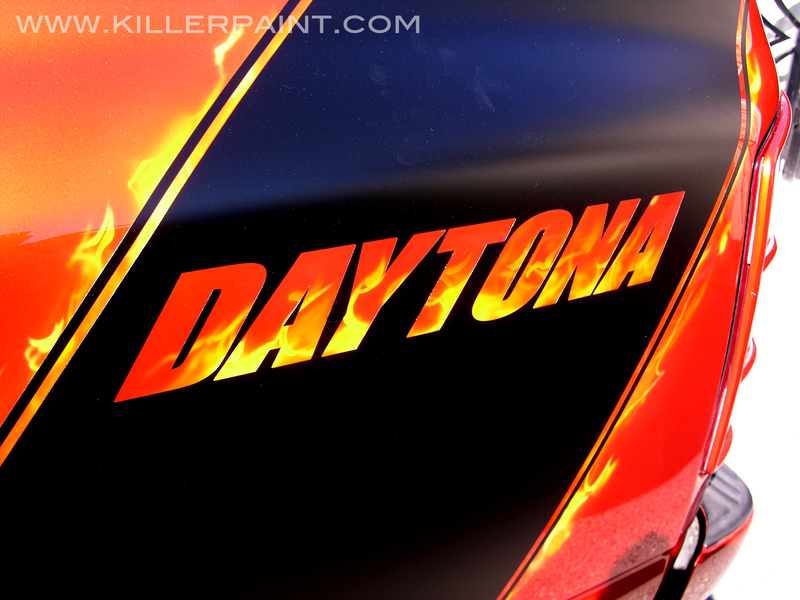 The sides of the Daytona also got the classic comet-streak of fire coming off of each of the wheel wells, running down the side and trailing off into smaller flickers toward the back. 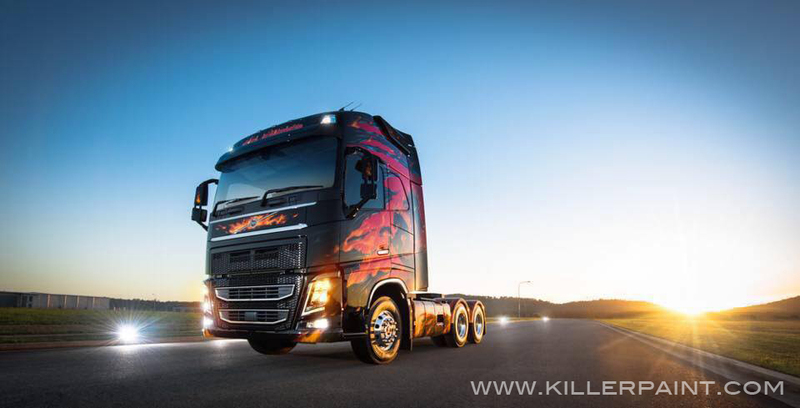 Fire off the wheels always makes it look faster, right? 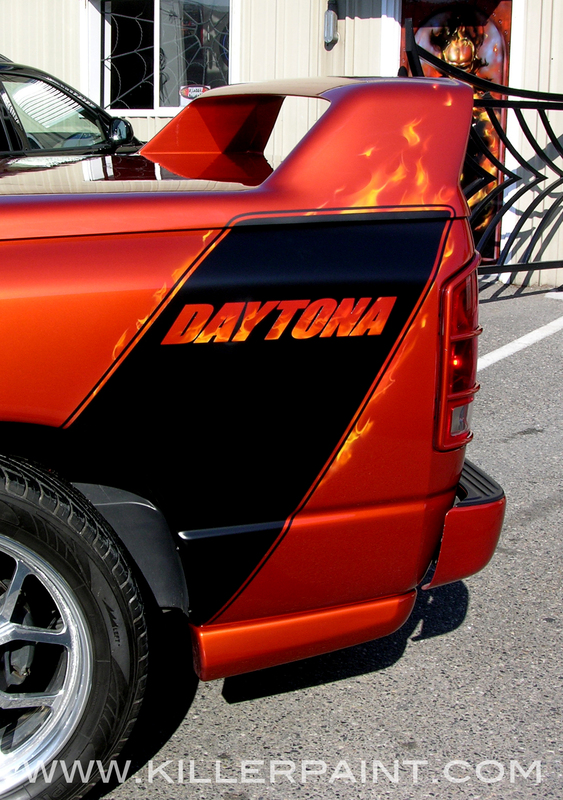 The Ram Daytona pickup was produced with a rear-fender stripe, just like the one on so many classic Dodge Challengers. 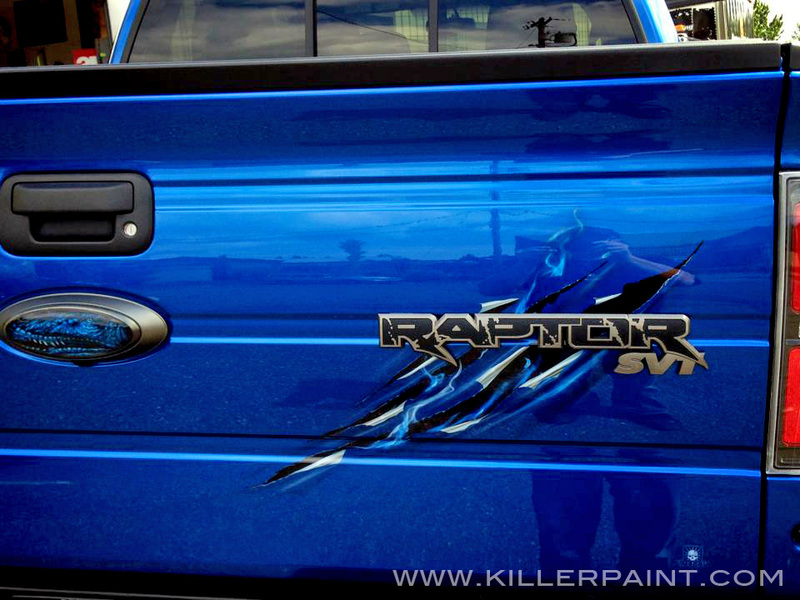 This vinyl stripe was removed, and redone in paint. 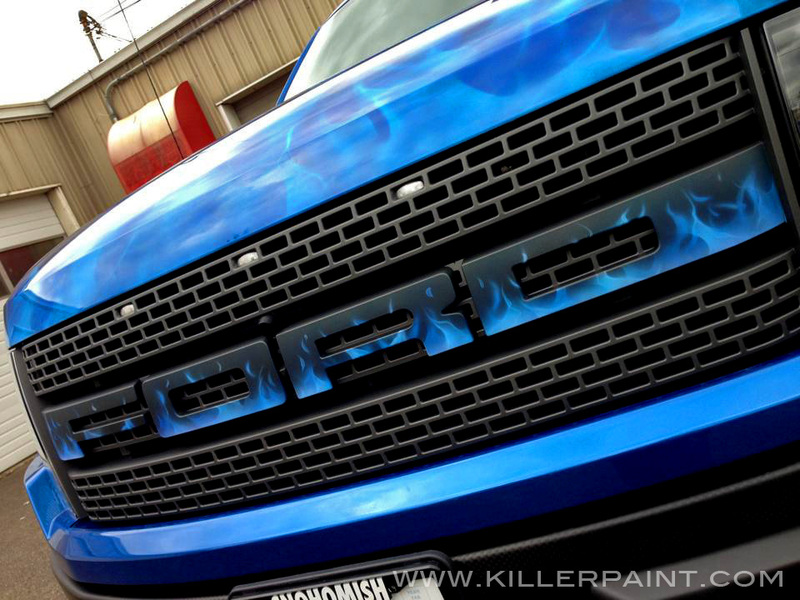 Of course, the “Daytona” logo inset on the stripe had to be set on fire, too. 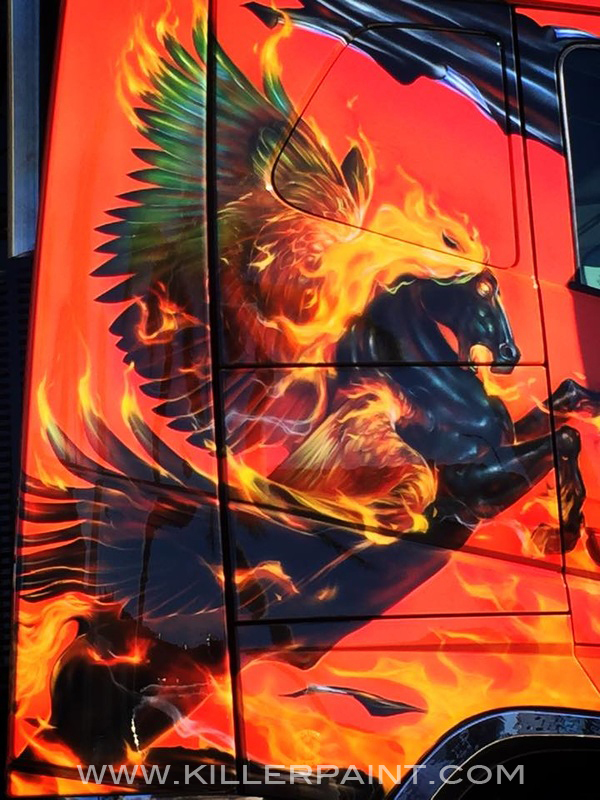 Mike had something special in mind for the tailgate of this performance truck. 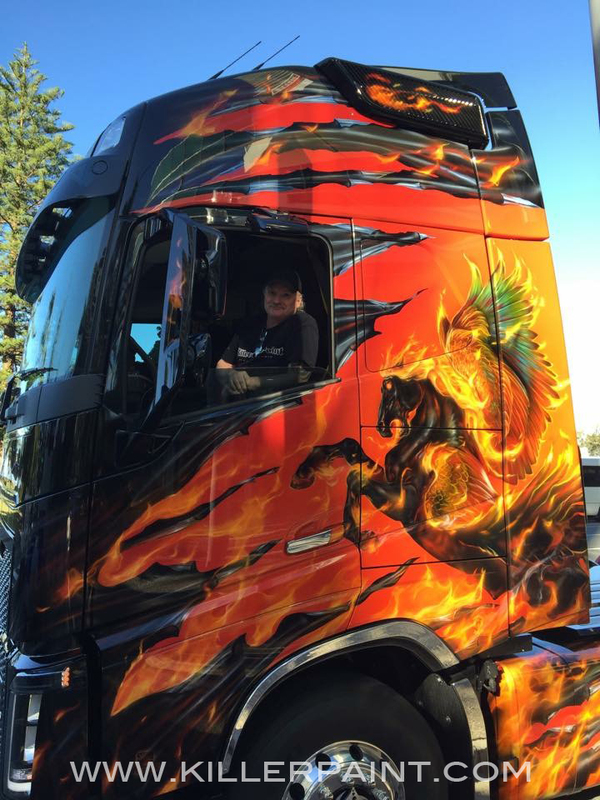 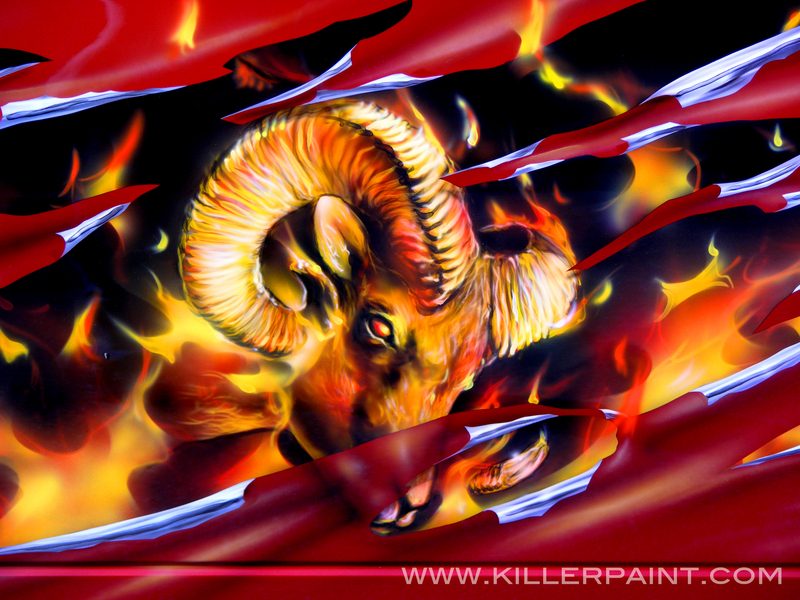 He painted peeling shreds, revealing a black opening with flames erupting out of it, and a fiery-looking ram bursting its way out. 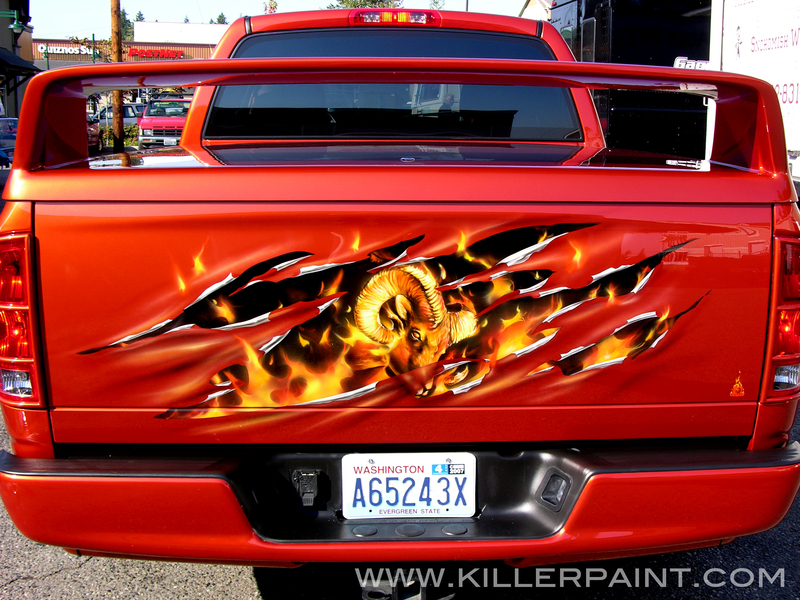 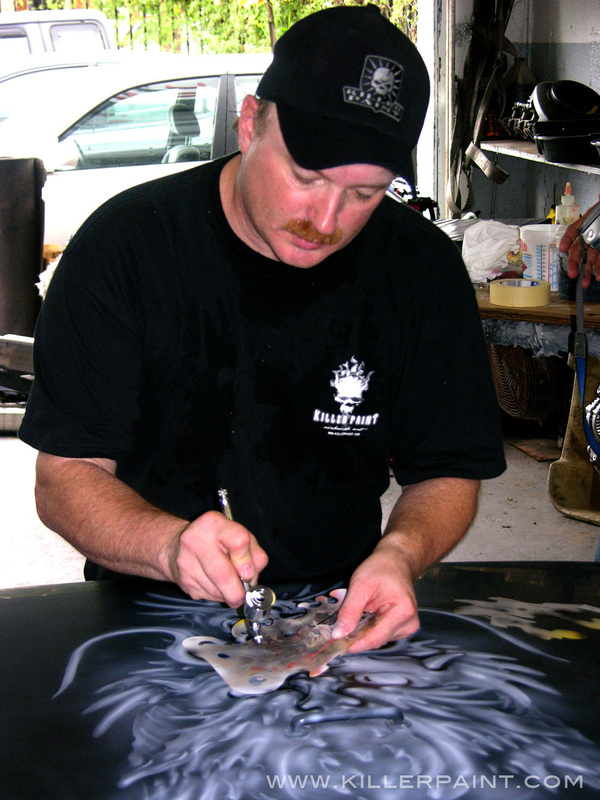 As one might guess, ram murals on Dodge trucks have been popular with Killer Paint’s other RAM-owning customers, too. 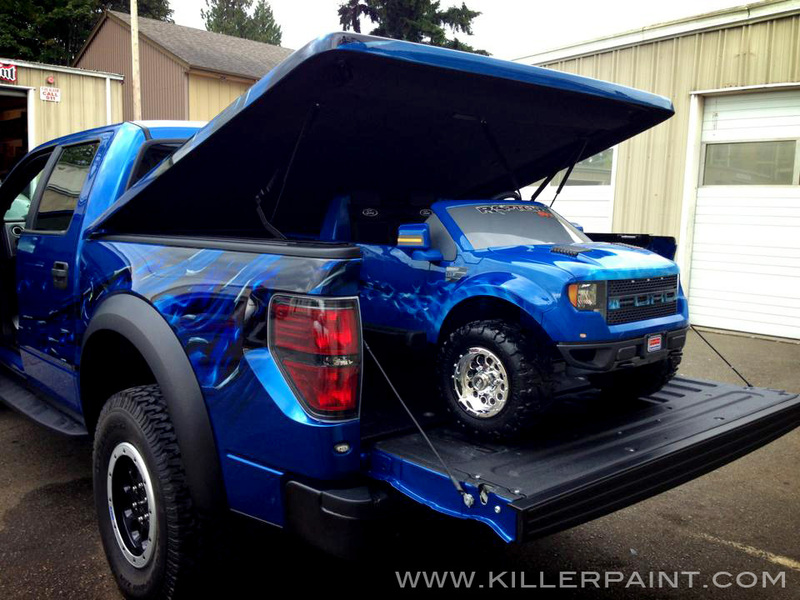 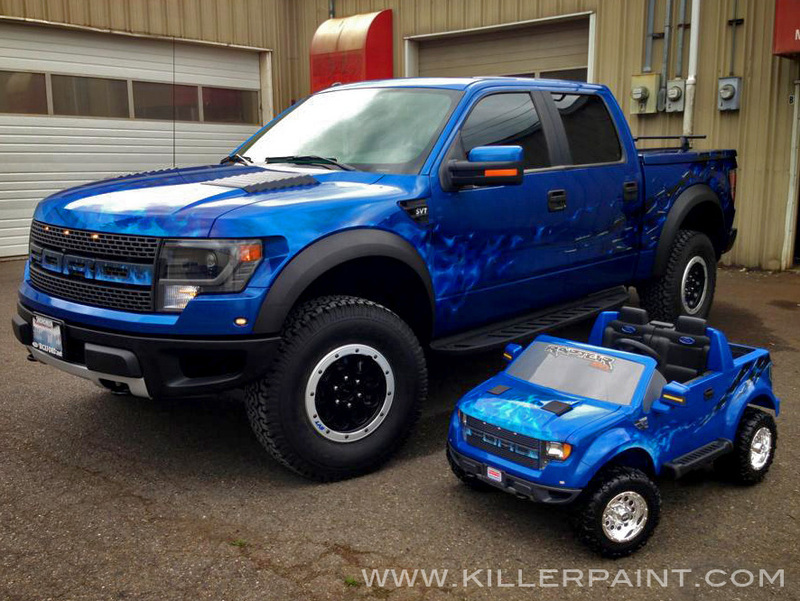 Maybe this truck gave you some ideas, or you already have an idea in mind for your own car, truck, motorcycle, etc.